The temps are still quite high here in Northern Utah but as I take my morning runs there’s finally a chill in the air letting me know fall is on its way. I’ve said this many times before but one of my favorite ways to get some inspiration for either decorating my home or putting an outfit together is to take a look outdoors. Wild sunflowers are blooming and standing tall on every trail I run on and what’s better than corn flower blue mixed with sunflowers. 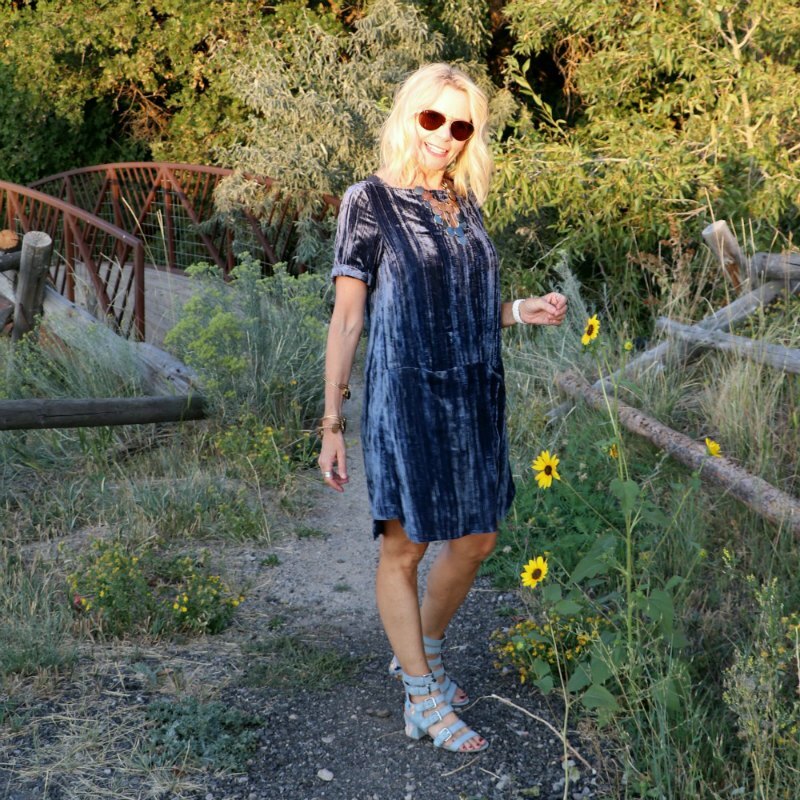 I shopped my closet again and grabbed my short sleeve velvet tunic dress, paired it with sandals and a fun statement necklace and enjoyed my day. Now I just need to drag out some of my blue dishes and vases and get my home freshened up as well. Hello lovely friend! Ah, velvet! One of my most favorite fabrics for Fall and this rich blue is fantastic on you! Love it with the strappy shoes. I have a similar burgundy shift dress I will wear soon, so you’ve got me excited! I cannot remember this velvet dress, neither the shoes. And I think this outfit looks wonderful on you. Necklace is of course always good with me. And you are right, nature gives us lovely examples. Trina I love this blue velvet dress on you and also the fabulous mix of the light blue sandals. I completely agree about getting your inspiration from nature. I do the same thing every chance I get. Have a wonderful week.